A: Accepted individuals are under no obligation to purchase. All individuals who are accepted, whether they enroll in a paid membership program or not, are listed in our online database where other members can access their information. This complimentary listing does not include log-in credentials for our online registry, but is navigable by more than 600,000 members. Q: Why the difference in price of your memberships? A: Worldwide Branding is a Personal Branding company that also has Who’s Who division that is exclusive to its members. A: Worldwide Who’s Who is the networking branch of Worldwide Branding and makes up only 1/10th of its services. Worldwide Branding is an all-encompassing personal branding company. We opened up a branding division to keep pace with the changing marketing landscape. As a personal branding company, we are now able to offer far more tailored services to our members, and open up membership to executives, professionals and entrepreneurs around the world. A: Scam, as defined by Merriam-Webster, is a “fraudulent or deceptive act or operation” (www.merriam-webster.com). Who’s Who, simply put, aggregates names of notable individuals and publishes them in a book. The practice of publishing individuals based on their careers and accomplishments is by no means a scam. There are companies in the vanity publishing industry that do not stand behind their business practices and have tarnished the industry as a whole. Worldwide Branding has been in business for more than 16 years and is much more than a Who’s Who, though we do offer networking within an exclusive membership. For more information about our array of branding products and services, please visit http://worldwidewhoswhoblog.com/the-evolution-of-worldwide-branding. We have a dedicated customer service team ready to assist you with any questions or concerns you may have. Please contact us Monday-Friday, 9am-5pm EST at (516) 833-8400, or email us at customerservice@worldwidebranding.com. Q: How are you responding to negative comments on social media sites? A: The Internet provides an open forum for exchange. Every company has positive and negative comments about them online, especially companies that have been in business for more than 15 years, like ours. We monitor and read each posting, but have found that most are either comments made by non-members or are vague complaints about “Who’s Who” companies in general. Since most of our responses to these postings have been deleted by the forum moderator, we created this site to dispel any rumors or misconceptions posted online. If you have any questions or concerns, please do not hesitate to contact us at customerservice@worldwidebranding.com. A: This is not an indication that the company is fraudulent. For your protection as an international consumer, your bank will flag purchases that seem out of the ordinary, particularly if they occur in a different country. This is just a precautionary measure by your financial institute. The transaction itself is NOT fraudulent, they are just ensuring you were the person actually making the purchase. A: Due to the personalization of our services our terms clearly state that all sales are final. However, we value our members and understand that situations may arise, which is why we offer personalized care and compromise to allow our members to keep the benefits. Cancellations are issued as applicable to country or state law. A: No. Your welcome information will arrive by email. Please be certain that you have added the approved email address: info@whoswhomail.com. If you provided your new membership representative with a mailing address, then you will also receive a postcard directing you to your personal URL for quick access to your welcome information. Q: My country is not listed in the drop-down on the landing page. What do I do? A: Simply send an email to info@whoswhomail.com and let us know what country is missing. Our programmers will add your country to the drop-down menu and we will advise you when you can log in. 1. A detail of the error message. Exact verbiage is helpful. 2. A screen capture, including URL. 3. Information regarding your operating system and Internet browser. Are you using a MAC or PC? Are you using Internet Explorer, Firefox, Chrome, etc.? 4. Information about when you are encountering the error. When you try to log in? When you try to download membership information? Once we receive this information from you, our director of process development and programming team will troubleshoot your issue and notify you once a resolution has been reached. Q: I received a postcard in the mail. How do I access my information? A: Simply type the URL on the postcard into your browser, preferably Firefox or Chrome, then follow the instructions on the welcome information landing page. Q: I received a letter in the mail that includes a link. How do I access my information? A: Simply type the URL on the letter into your browser, preferably Firefox or Chrome, then follow the instructions on the welcome information landing page. Q: I have not received my welcome email yet. What do I do? 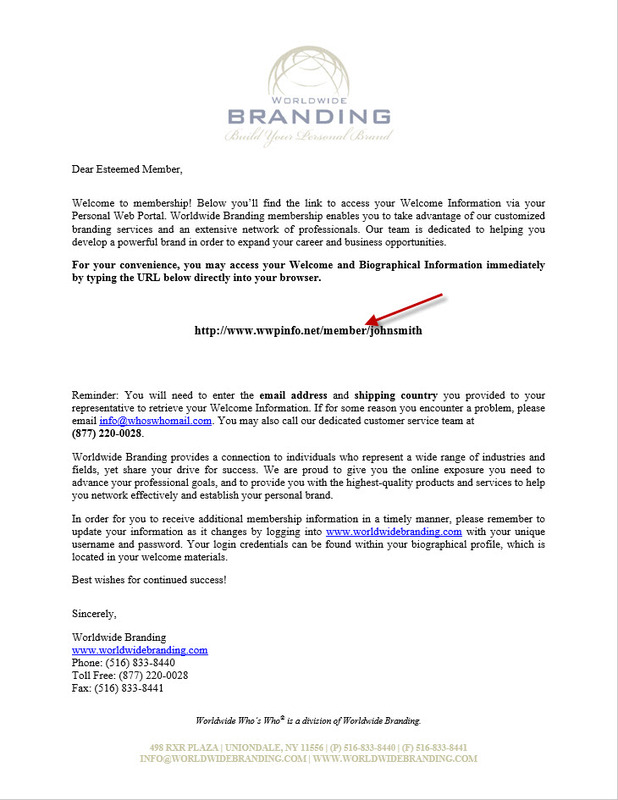 A: If you have not received your welcome email within 15 business days of your membership, please contact customerservice@worldwidebranding.com or call us between 9:00am-5:00pm EST at (516) 833-8400. 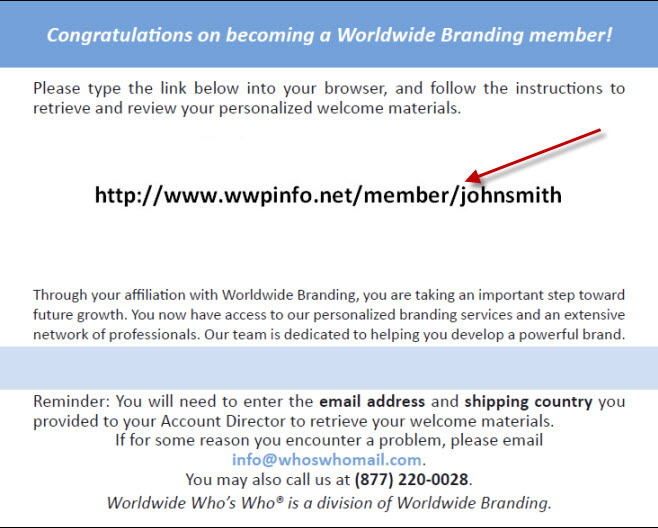 A: Simply log into www.worldwidebranding.com with the username and password provided to you in your welcome information. Click on ‘Edit My Profile’ and make changes instantaneously online.